I love that these authors got together to put MY TRUE LOVE GAVE TO ME out into the world. There are definitely some of my favorite authors’ works in here (Rainbow! Gayle! Stephanie!) and I had soooo much fun reading all of these short stories (although some I wished would go on forever)! It’s hard to review a collection of short stories so I’ll just say a few things on each one of them! Sigghhhhh. Dreamy sighhhh. I just love Rainbow Rowell’s writing. Something about it just stirs up all of the butterflies in me and just feels so wonderful and comfortable and makes me feel like I’m coming home. MIDNIGHTS was a story about the New Years Eves that Mags and Noel share and their story just hit all the right places for me. I wished there could have been SO much more of this short story. It was truly perfection. I’ve never read anything by Kelly Link before so I had no idea what to expect, plus I think it’s REALLY hard to follow Rainbow’s beautiful story. THE LADY AND THE FOX was interesting but it had a weird feel for me… Like it was almost old and new all at once. I think this story could have been better (for me) if it was longer because I needed to really bury myself in some of the details and backstories a bit. Rainbow’s I wished could go on forever because I loved it and this I wished could go on longer because I just needed a bit more story to make that connection! I really, really liked this story! It was very different from the first two and I loved how the two characters — Shy and Haley — came together. I really liked Shy and really felt for him being away from his family and everything that was going on with his family during this holiday season. I really connected with this one (another one I wish there was more of!) and it was really interesting to get to know his character. I loved the male voice and I just really enjoyed this one a lot. And fresh snow! Sigh. It always gets me. This story was really cute. It definitely had a feel between Elf and The Santa Clause! The main character Natalie was adopted by Santa, lives at the North Pole with the elves, and has a crush on one of them. They don’t believe her when she says she’s kissed a real human boy before. The story is just sweet, very fun, and I love how it captures the spirit of Christmas and makes a YA story out of elves & Santa! Oh, Stephanie. How does she alway write such wonderful and poignant stories? I just loved this one and everything it was about. The little romance was adorable and I loved how everything came together. It’s so funny because I never expect to find such deeper meaning in such short stories but yep, sure enough. Steph has it in there. Loved this one! Loved how it ended too. This was definitely a little bittersweet but I loved the sentiment behind it. It was really interesting to see the family dynamic unfold in such a short story and I really would have loved to read more of this one too. Each person is not without their flaws and it was really great to see this cross-section of characters come together to keep a little girl’s dream of Santa alive, all the while trying to hold together their own dreams. Man, I loved this one. I personally haven’t read KRAMPUS but my besties Alyssa & Amy have (and love it) so I was happy to read a little piece of Krampus through this short story. Krampuslauf was all about friendship, loyalty, and honor – including a little traditional Krampus justice. I loved the touch of magic and the feeling that there really can be magic in the world if you’re open to believing. How very Gayle. I just love how she brings so many things together in one story so effortlessly (or maybe it just seems effortless). Gayle’s stories always seem to follow the vein of finding your true self and being happy with what you are, who you have, and where you want to go. So many times I’ve related to these things and I love the college setting for Sophie Roth. It’s such a big starting point for so many people to go and truly start becoming who they really are. A cute little story with Southern charm about a troublemaker and a pastor’s daughter. I really enjoyed this one (though always thrown off by a female author writing a male POV when I don’t expect it! Still love) and it was a riot to see Vaughn the perpetual mischief-maker try to bring together a Christmas pageant. I also love that not everything is what it seems in this story… Lots of ideas that your assumptions about people or what you see on the surface is not quite what a person’s character is truly about. Oh, I loved this story. I half-expected this to have another hidden magical meaning (like real elves or a real Santa) but it was definitely more just a story of the characters making the magic for themselves. I really loved seeing these small-town characters start to find their way, and somehow all of these Christmas stories end up being the main character finding out that what he/she thought ran far deeper than they thought. It was so heart warming and really very dynamic for me. I could just picture myself in Christmas, CA. That was such a sweet story. I love the Ally Carter feel to it and how much fun! The concept was great and I loved the way it ended. The setting was wonderful (I love books set in the middle of nowhere) and I absolutely loved the characters – from “Hulda” to Ethan to Aunt Mary. I think this was one of my favorites! I just wanted to read an entire book and I was even already picturing it as a movie haha! Wow, this was wonderful. It actually took just a little bit to get into but I really, REALLY ended up loving it. It had a bit of a Daughter of Smoke and Bone feel (well, that’s all I’ve read by Laini Taylor) and yet still very much original. I loved Laini’s writing and I absolutely adored where this story went. It was such a beautiful tale and I really just dreamily sighed at the end of it. Outstanding. Kept Me Hooked On: Anthologies. I actually haven’t read many anthologies! Usually the novellas or short stories I read are part of a series and that’s why I pick them up. I love that these were all bound up together and even more so, that the authors took the time to team up for this. Left Me Wanting More: Flow. Some of the stories didn’t really flow well from one to the next. I mean, of course that has to do with personal taste as well, but it was really hard to go from kicking it off with Rainbow Rowell (LOVED that one) into Kelly Link (sorry Kelly) which had a very, very different feel and totally different focus all together. I think they could have been arranged a bit differently to give the overall collection a better flow. This collection was so much fun. I really loved getting twelve different Christmas stories and I wished some of them could have gone on for much longer! It’s the perfect book to read bit by bit during the holidays. This entry was posted in Books, Contemporary, Review, YA and tagged Anthology, Books, Christmas, Contemporary, My True Love Gave to Me, Novella, Review, Short Story, YA, Young Adult on December 24, 2014 by Brittany. We seem to have the same favorites from this anthology! (Except for Laini Taylor’s–I wasn’t a fan of that one. I preferred the contemporary stories.) I absolutely loved both Rainbow Rowell and Stephanie Perkins’ stories. Shy and Haley were one of my favorite couplings, so I loved reading Angels in the Snow. Christmas, CA was another one that I loved. 🙂 Those four are the ones I’m likely to read again sometime. I have this from the library, and I need to read it soon. I’ve been hearing good things, and I’m glad to hear that you liked most of the stories. I have read the first one by Rainbow Rowell and I thought it was really sweet. When I got rejected on Netgalley (because I requested too late), I almost wanted to cry. This is one of the books I’ve been most looking forward to! So glad you enjoyed it and that most of the stories were really enjoyable! Great review! Hah your thoughts pretty much mirror mine EXACTLY. Kelly Link’s story didn’t really work for me but I was pleasantly surprised by Matt de la Pena’s and I really enjoyed Holly Black’s (it was a welcome and fun change of pace) but I admit I expected a little more out of Jenny Han and David Levithan. But all around this was a solid short story collection and perfect to get me in the Christmas spirit! The book I would choose would be My True Love Gave To Me because it is full of stories from my favorite YA authors. 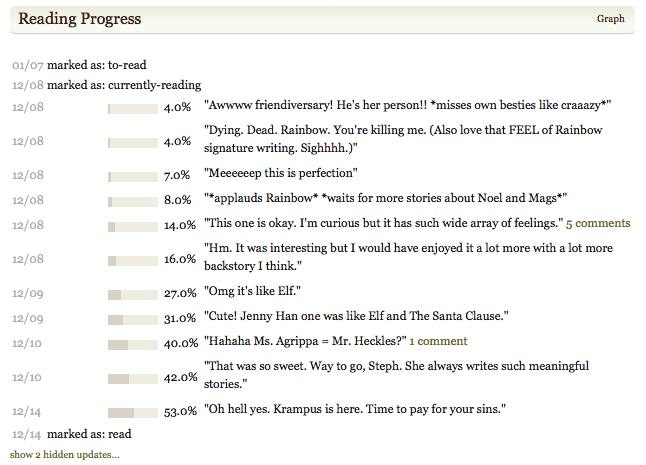 I try not to read reviews until after I’ve read a book, but I did notice that you rated each story. Really curious about the story you gave a 4.25. I did read the Left Me Wanting More & Kept Me Hooked On parts. I like how you break down your reviews. That’s always the bad part about short stories, you wish the story would continue.